I've been to Dublin, Ireland five times thus far and I cannot get enough of this place. Everything from the scenery, to the locals, and to the beer. Yes, Guinness. The delicious smooth, dark stout is sure to fill you up like a pint sized meal. You haven't officially had Guinness until you've had a pint in Ireland. It's the ambiance of an Irish pub that cannot be experience nor replicated anywhere else. In Ireland the tap is constantly flowing and patrons are guaranteed to have a nice fresh glass of Guinness. 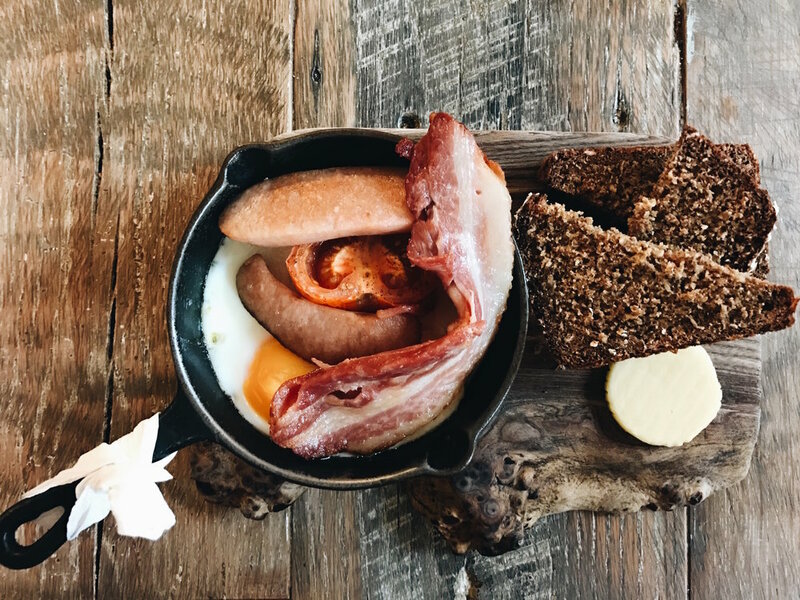 Another staple in Ireland is the Irish Breakfast, which consists of bacon, sausage, bread, tomato, and eggs. It is a fairly common practice to pair an Irish Breakfast with pudding and beans. After finishing my work duties in Ireland, my first mission and top priority was to find a delicious Irish breakfast. Breakfast is my favorite meal of the day, and naturally I turned to Yelp to guide me to the best breakfast place in Ireland. The extensive "Yelping" led me to Hatch & Sons (photo below). Hatch & Sons easily became a favorite spot of mine, as the restaurants offers delicious Irish Breakfast but with a modern twist. I highly recommend ordering double baked eggs with sausage, brown bread and juicy bacon. Hatch & Sons offers an open kitchen, meaning guests can watch as their chefs prepare the meals. And judging from the meal I had, along with the cream in my coffee, Hatch & Sons offers farm fresh quality ingredients in their food. What's breakfast without donuts? After a quick stroll, I stumbled across a long line coming out of Rolling Donut. This doughnut shop reminds me of Psycho Donuts (San Jose, California) or Voodoo Donuts (Portland, Oregon) due to their unique flavors and unorthodox doughnut designs. As a doughnut fanatic, I had to treat myself to a Rolling Donuts' Coffee-Flavor baked goodness. I can see why there is such a long line. These popular breakfast items are sweet, soft and fluffy. I recommend pairing a Rolling Donut's doughnut with a cup of flat white. They also offer vegan options as well! I was so full from breakfast I could only stomach one of their doughnuts, but I will return to Rolling Donut the next time I am in Ireland. 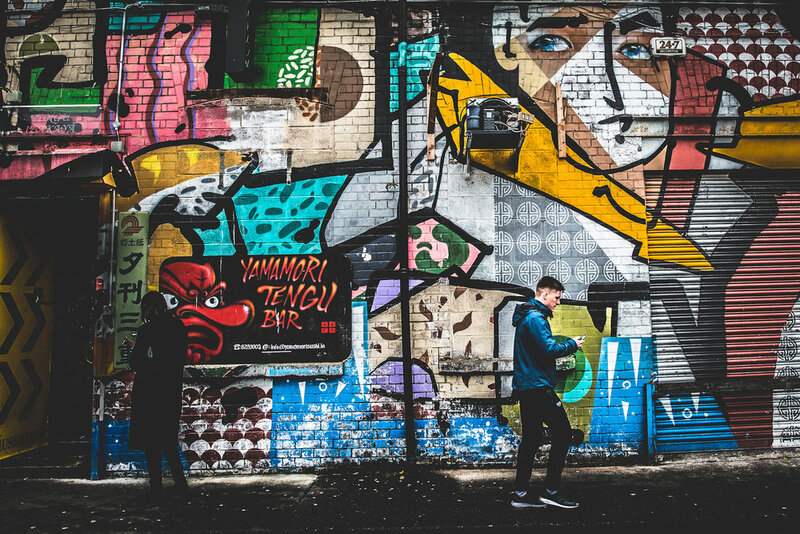 You can enjoy colorful artwork along Temple Bar and all over Dublin, Ireland. But don't forget about the endless alleys of pubs, cafes, and restaurants. With just eight hours left before my flight back home, I was only able to check out a few local spots, do some people watching, and a bit of souvenir shopping for my wife. However, I have compiled a list of recommended places to visit while in Dublin, Ireland. Ely Bar & Brasserie - This restaurant has a large collection of wine. You can enjoy a meal in a 200 year old vault, which has a strong history behind it. An employee of mine mentioned that they fed 3,000 soldiers from the Crimea back in 1856 in the very same vault. Dawson Lounge - This is the smallest pub in Dublin. However it is a nice spot for those who are looking to get a pint or two and get cozy with friends. However, be aware that it can get a bit claustrophobic in there. The Bank Bar and Restaurant - This bar is the opposite of Dawson Lounge. I love the beautiful artwork on their high ceiling and the architectural details inside. The restaurant is very spacious. I recommend this place for those who want to grab drinks but have some elbow room, and not feel packed like sardines. Bison Bar - A whiskey bar with all kinds of....whiskey! Yep. Excellent place to have a night cap and enjoy some of the finest and rarest whiskey from Ireland. Perfect place for the whiskey connoisseurs in you. And if you aren't feeling like having whiskey, you can always grab a pint of Guinness!